Have a favorite website that you read on your iPhone, iPad, or iPod touch and perhaps you’d like to have faster access to it? You’re probably reading it this very minute, right? Of course you are, but rather than launching Safari first and then going to a web page, you can add this website or any other as a homescreen bookmark, making it instantly accessible from iOS with just a tap. Setting up quick access to websites with a homescreen icon bookmark is super easy, this makes the website accessible right from the home screen just like an app would be, simply tapping the icon launches the webpage. 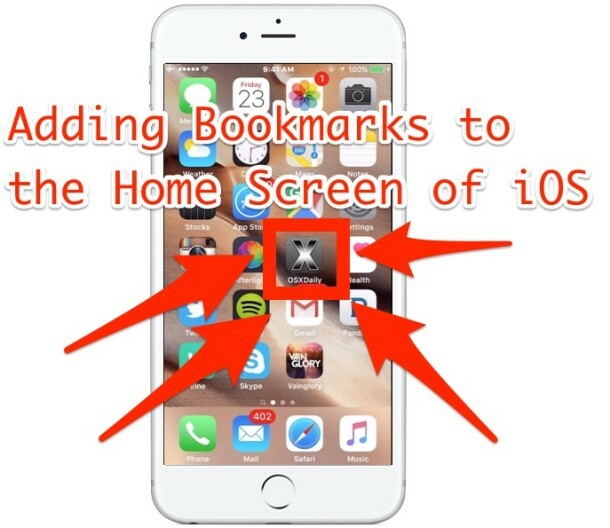 You will be sent from Safari to the home screen where the bookmark icon appears. Place it accordingly on the home screen, in the Dock, or create a handful of them and make a dedicated Bookmarks folder for quick access to all of your favorite websites. 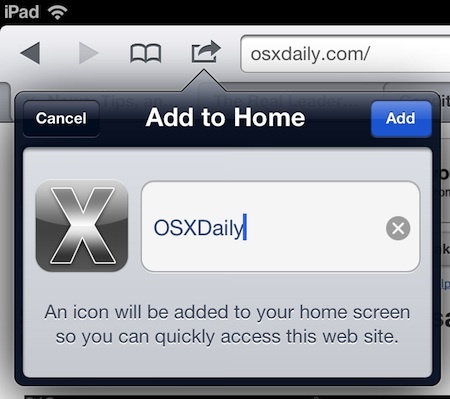 Personally, I prefer this to showing the bookmarks bar in Safari on iPad or using bookmarks through Safari in general. I just have a handful of websites on my home screen and access them from there. If you were wondering, the icon used by Safari’s home screen bookmarks, known as an Apple Touch Icon, can be customized by any web developer on a per site basis rather easily. If a web developer doesn’t specify a touch icon, Safari will use a thumbnail of the index page as the icon instead. This works in all versions of iOS, just look for the little square box with an arrow flying out of it. The appearance of iOS has changed throughout the years, but the function remains the same. Happy bookmarking! Can you do an article on how you can make those bookmarks open on Google Chrome rather than directly to Safari? What I do is made a custom bookmarks HTML page and uploading it to my own server, it’s the default on all web browsers and I only have to change things from one place. Try it out! Can I add shortcut links for websites to my home screen (not the dock) on my macbook pro?